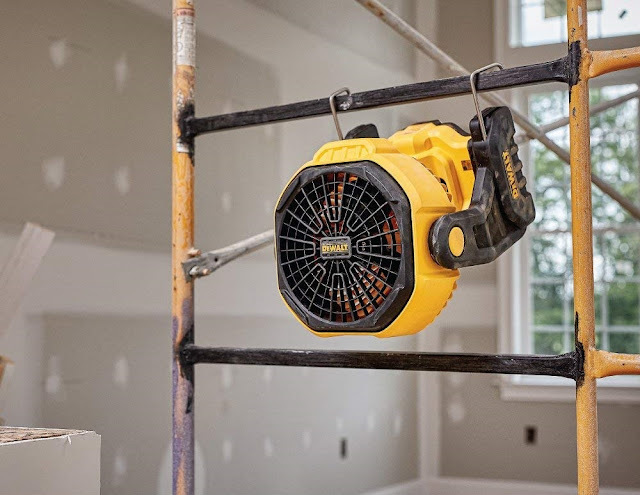 The Dewalt job site fan is one of the most popular fans on the market today. A hard-working unit, this fan will run off the Dewalt battery system for hours, almost effortlessly - meaning it is a nice and quiet unit. It's not so big that it can't be easily stored away when not in use and it on the pack of your ute or pick up with no worries. You can plug in the standard 120-volt cord or connect a Dewalt battery (20-volt maximum) to it. 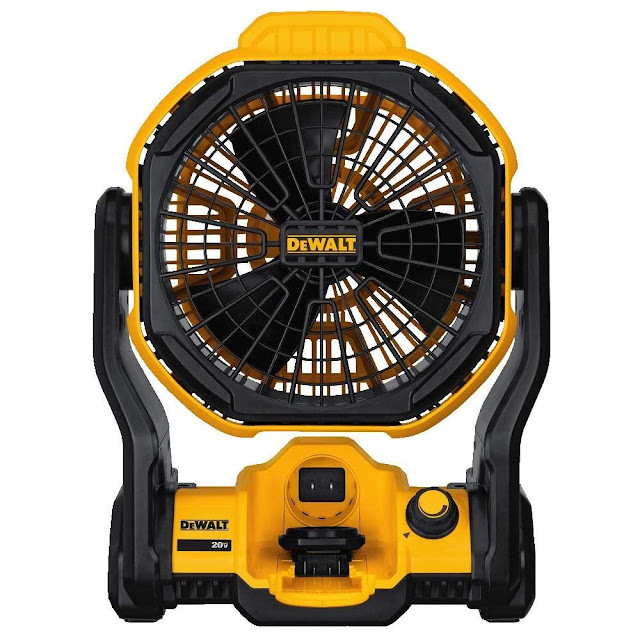 As the reviews below show, you will get plenty of 'air time' with this Dewalt fan. Testing to IP54 standards - meaning it has 'ingress protection' from dust, dirt, splashes of water etc. The unit has three blades which are 7 inches long and they will turn and turn all day to keep the air moving to keep you cool and to also help expunge unwanted smells such as smoke from soldering or other discharges. You can even use it to help dry painted walls, dry wall, and plaster mud. "Love this fan so far. The fan pivots back more than 90° as you may see from my picture. I was concerned the bigger flexvolt battery wouldn’t fit in it but it does with ease. I’m currently conducting a run till dead test to see how long it will run at high-speed with Dewalt’s strongest battery the flex volt 9.0 AH battery. Seems pretty well-made, however, I’m going to hang on to the box to carry it in just to protect it. I hope the DeWALT comes out with a carrying case for this. The hooks pull out from the base allowing you to hang the fan on the job site, which is a nice touch. As many have already posted you can plug it in but not while you have a battery in the battery socket. To use AC will need an extension cord with a female plug on one end just as the DeWALT power pack inverter uses." "I am very Happy with this unit after day one. I placed a DCB203 20V Max 2.0AH Compact XR Li-Ion Battery Pack (Smallest they make) into the Fan, turned it on low at 10:45am. At 10:28 PM then unit is still running. On Low speed, you can not even hear the unit running. Will be running the unit on Medium speed this weekend, same battery." So it will run all day. "This thing is made STRONG. This last week at the market I was pulling it down and it slipped. It fell from about 6ft and hit concrete. Didn't even scratch it. I'm not saying drop it on purpose but I thought for sure it would have been damaged if work at all. And it turned in and worked perfect! I love tho fan! This is the 2nd fan I've bought. I love it! I use it for a weekly Farmers market tent. I hang it from the frame and it keep my customers cool while they shop. My original purchase was for the fan, battery set and charger. A full charge battery will run this fan on high from 8:30am-2:00pm and still have over half charge. It creates a nice breeze. Made 100* market days much more bearable. Highly recommend this little workhorse." "I purchased this fan for the specific purpose of having some kind of cooling device available during a power outage. As such, I wanted to know exactly how much cooling time I would get from one battery. I'm using a 60-volt, 6.0 Ah "flex-volt" battery; however, my 20 volt, 4.0 Ah battery also (obviously) works. I turned on the variable speed fan to half speed; it's VERY quiet. The design of these batteries is such that they don't slowly wear down--instead, they just quit when the voltage drops too much--so, I suppose it could quit at any moment. But, after twelve hours, the fan is still going strong, and the battery still has 2 of its 3 charge level lights on (3 lights would be a full charge). I have to tell you, I am damned impressed! Well done, Dewalt!" If that doesn't convince you, check out the unit on Amazon. Dewalt not only make fans, drills and other tools - they make quality safety glasses!